I am just getting started on putting my info in this page. That's why it appears sparse. I have much more info on these lines and branches than appears in the "sketch" on this page. So please, before leaving too quickly, I urge you to explore through the links of the website. What you came here seeking may indeed be here, but just not showing in this particular page, yet. The chart with columns immediately below here has my Paternal side in the two columns on the left and my Maternal side in the two columns on the right. It is also given in a different format below. Rev. Samuel H. Weed was father of Margaret. Webmaster's paternal grandfather, Dr. Charles Lupton Gillette. Webmaster's paternal grandmother, Margaret E. Weed. Webmaster's maternal grandfather, Donald Stimson Graham. Webmaster's mother, maiden name Graham. The webmaster's father was ________ Gillette, one of the sons of Dr. Charles Lupton Gillette & Margaret E. (Weed) Gillette. 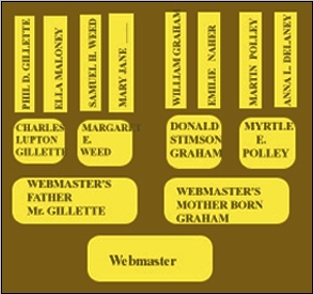 Webmaster's father married ________ Graham, daughter of Donald Stimson Graham & Myrtle E. Polley. Charles Lupton Gillette's parents were Phil D. Gillette & Ella Maloney. Phil D. Gillette's parents were Gelston Gillette & Rozella Randall. Gelston's father was Zebulon Gillette. Zebulon's father was Rev. Elisha Gillette. Rev. 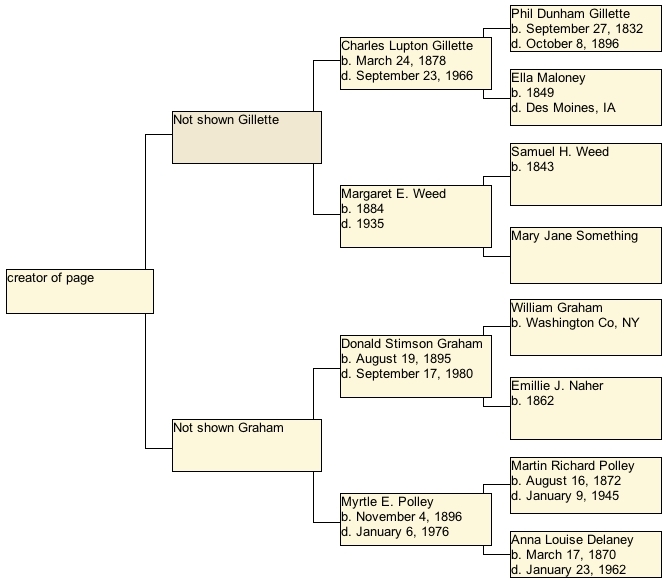 Elisha Gillette's father was William Gillette who was married to Elizabeth Welch in 1722 in Milford, CT.
Donald Stimson Graham's father was William Graham. William Graham's father was Walter Graham. Walter Graham's father was William Graham, born 1797 in Scotland, came to Putnam in Washington County, NY. Myrtle E. Polley's parents were Martin Richard Polley & Anna Louise (Delaney) Polley. Martin Richard Polley's father was P. P. Polley. We have all these lines going farther back, and sibling and other info in each generation.